Hi! It’s been a while since I did a last blog about materials because of the busyness of the season. Well here is me trying to do more as we go along. Anyway today we talk about the basic of the basics, the best friend of the artist and the icon of creativity- the pencil.There are different kinds of pencils but we will be talking today about Graphite Pencils which are most commonly used in drawing. In this article, we will explore the kinds of pencils, the pencil grades and which is best for which kind of art. I am also going to tell you my favorites and what I think you need in pencil drawing. Again, this is a matter of my personal opinion. Any comments or arguments may be said in the comments. I am in no way an expert but I do share what I know. There are different kind of pencils that are commonly used by beginning artists. With pencils, I believe that you do not have to buy the most expensive kind or everything. The pencil is the most basic of basic materials and should be the one that you use most comfortably. That is where everything starts, after all. Sketching is the first thing you do when you start a piece or practice so you have to find pencil that suits you and your style– as well as something that you are most comfortable with. Some people work well enough with a regular Mongol school writing pencil in #2 which is the same grade as the mid-way drawing pencil 2B. Some like Mechanical pencils which suit people who draw a lot of detail because of its needlepoint precision. 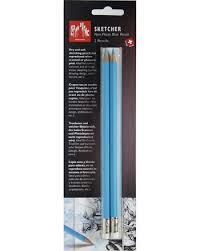 Some like lead holders/clutch pencils which allows the artist to shade freely and draw details with the point easier, however these clutch pencils are quite expensive and are actually kind of hard to find. Whatever you are more comfortable with, should be the pencil that you use to draw. I myself, prefer the wood-encased pencils — however, I do have a favorite mechanical pencil (which I call the magic pencil) because when I use that pencil I tend to do a lot of my best work in it. But of course that is just me. Aside from those kinds of pencils, there are also the colored lead type which is PILOT ENO. It is a mechanical lead pencil with colored LEAD which helps those like me who sketch messily find their lines in the sketch. It has several colors from green, blue, light blue, purple, red, pink and i think orange. I prefer using the light blue lead as a sketching pencil especially for inked works because that kind of pencil isnt seen in scans and can easily be edited out in photoshop. pilot ENO is available in National bookstore. I also have a non-photo blue pencil which is similar to what the light blue pencil in PILOT Eno does. This light blue pencil is used by professional comic artists to sketch. I bought mine in Japan, and steadler used to have it here however now its kinda rare to find. So I would suggest using Pilot ENO or a regular pencil instead. 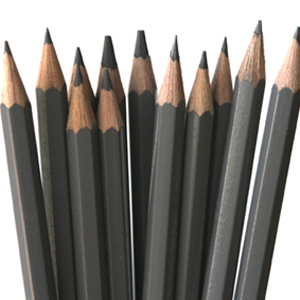 Generally speaking, we have Graphite pencils which is the most common. These drawing pencils come in many brands but they have lead grades that ranges from 9H up to 9B. As a general rule of thumb, think of the grade as H- HARD, B- Soft. HB is the regular Writing pencil and there is a pencil called F which means Firm. Normally, H is good if you want light lines. However, does do indentions on the paper and is quite hard. Some H pencils are hard to see and they are ideal for detail work especially when doing detail inkwork. B pencils are softer and are used to shade and smudge. Some people swear by an 8b pencil and do great portrait work or graphite work in it. B pencils tend to be dark and could easily be spread out. Most artists start off with a good 2B pencil and work from there. You don’t have to buy all the pencils out there to make good graphite work. Most of us, like myself, use the pencil only to sketch out my artwork before inking or coloring it. For that, I prefer using a mid-range pencil – F or 2B. There are times where in I am cautious about the cleanliness of my work, so I would use a lighter pencil. I would use only up to a 2H pencil or 4H (whatever is available) to do my sketches before inking them. So, Marikit what pencils do I really need to get? As I said before, you can use whatever pencil is available t you at the moment to practice sketches. However, if you are itching to buy yourself a set of drawincils, then I would recommend the following grades depending on the type of work you are doing and your style. For anime and manga artists who like doing tight sketchwork and details – 2H for initial Sketching or F and 2B for darkening some lines pre inking. For those who like to darken their lines and who prefer softer pencil feel : 2B or F for the initial sketch then 4B and 6B for darkening. I would use fingers, a tortillion or stump to blend or a cotton bud. For those who are doing portraits and other detailed graphite work, then I suggest to get the following pencils. 4H, 2H, 2B, B, 4b, 6b and 8B. As you notice, my goto pencil is the 2B which is the most common grade. Why? Its easy to smudge and is easily available (its like the mongol #2 pencil you use in tests) its also pretty easy to erase. So I do recommend that. So Marikit, now I have my pencils how do I use them properly or is there any special care for them? For those using the pencil to shade, an exacto knife or box cutter should be used to get the longer lead out of your wood cased pencils. Now that you have your pencils, go ahead and enjoy! Sketch and practice and shade to your hearts content. The pencil is the artists best friend so make sure you do get to know him a lot.